The Dune Group is raising the bar in retail for its dynamic digital signage in newly refurbished stores across the UK, US and Switzerland. 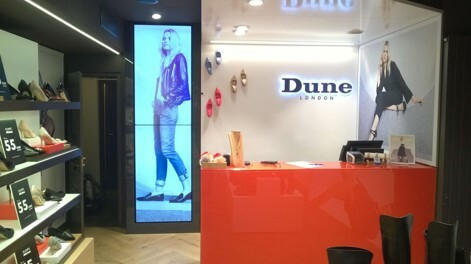 For its new flagship store on Oxford Street, the challenge for Dune’s Merchandising Department was how to bring the brand to life and really encapsulate its passion for style and sophistication and decided to investigate the possibility of using video walls. They turned to AV supplier and installer Project Audio Visual to specify a complete solution. Project AV specified eighteen 47” portrait displays for the store, driven by BrightSign XD1230 media players and mounted on Peerless-AV Full Service Portrait Video Wall Mounts. Since this initial installation, video walls have been installed in 13 further Dune outlets. As part of the fully-managed package, Project Audio Visual advises Dune on content updates, runs maintenance checks to ensure all players are online and provides a call-out service to deal with any issues.